Edmund of Woodstock, Earl of Kent. Edmund Plantagenet was the second son of King Edward I and his second wife, Margaret of France and the half brother of King Edward II. Edmund was born at Woodstock in Oxfordshire on 5 August 1301 when king Edward was well into his sixties. King Edward I had taken great interest in the upbringing of his two sons by his second wife, Edmund and his elder brother, Thomas. Prior to his death, he had intended to provide the young Edmund with substantial grants of land. In August 1306, he signed a charter promising Edmund land worth 7000 marks a year, and in May 1307, a further 1000 marks was added to this. Edward had intended to grant the earldom of Norfolk to Thomas, and that of Cornwall, to Edmund, which had been vacant since the death of his cousin Edmund without children in 1300. When Edward II succeeded his father, however, he granted the earldom of Cornwall to his favourite Piers Gaveston, but did provide his half-brother with an income of 2000 marks a year. He was created Earl of Kent on 28 July 1321. Edward II's relationship with Gaveston was the source of mounting ill feeling amongst his barons, Gaveston was executed by barons opposed to the king's favourite in 1312. In 1318, in an effort to reconcile the opposing parties, the Treaty of Leake was drafted, Edmund was among the witnesses to the signing of this treaty. In the spring of 1320 Edmund formed part in an embassy to Pope John XXII in Avignon, to absolve his half brother the king of his oath to uphold the Ordinances, a set of restrictions imposed on the king by the barons. In October 1320, Edmund attended his first parliament. The tense political situation between the king and his barons escalated into full-scale rebellion in 1321-22. The barons resented the king's new favourites, Hugh Despenser the Younger and Hugh Despenser the Elder, who had succeeded Gaveston in his affections. Bartholomew Badlesmere, steward of the royal household, defected to the opposition, and Edward II appointed Edmund Lord Warden of the Cinque Ports in his place. During the parliament of July 1321, Edmund briefly sided with the opposition when he agreed to exile the Despensers, but in November sat on the council that annulled the exile. In October, Edmund took part in a siege on Leeds Castle in Kent, where Badlesmere was holding out. Badlesmere was forced to surrender and Edmund moved to the Welsh Marches, where Roger Mortimer was in open revolt. 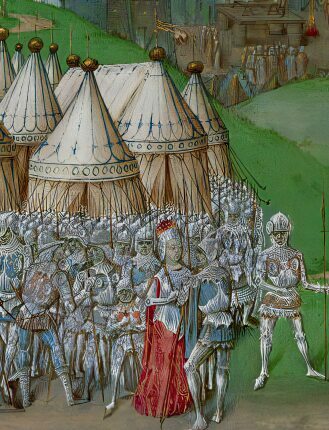 When confronted by the royal army, Mortimer surrendered without a fight. The king was now free to deal with the leader of the opposition to his rule, his cousin, Thomas, Earl of Lancaster. Edmund was ordered, along with the Earl of Surrey, to capture Lancaster's castle of Pontefract. After being defeated at the Battle of Boroughbridge, Lancaster was taken prisoner on 17th March 1322 and taken to Pontefract. Edmund sat on the jury which condemned his cousin to death for treason. Lancaster was not allowed the right to speak in his own defence, nor have anyone to speak for him and was found guilty of treason and sentenced to be executed. On 22nd March 1322 he was beheaded near Pontefract Castle. The rebels, however, were still not defeated. Edmund took Wallingford Castle from Maurice de Berkeley in January 1323, and was rewarded for his loyalty with substantial holdings in Wales. The greater part of the spoils of war, however, were granted to the Despensers, who both benefited greatly from the forfeiture of the rebels, underlining the fact that Edward II had learned nothing from the mistakes of the past. With opposition in England largely overcome, Edward arranged a major campaign into Scotland in August, which met with total failure when the English were routed by the Scots, under the leadership of Robert the Bruce, at the Battle of Old Byland on 14 October 1322. The king of England was forced had to ignominiously flee the battlefield to avoid being captured, Edmund was amongst the royal army as it retreated to the city of York. The king's inability to handle the Scottish situation was becoming apparent. Andrew Harclay, who had defeated the Earl of Lancaster at Boroughbridge, signed a peace treaty with the Scots without gaining the royal sanction in January 1323. When the king discovered this, he ordered Harclay's arrest. Edmund was one of the judges that who passed judgement on Harclay, who was hanged, drawn and quartered for treason. Edmund was given responsibility for the defence of the border with Scotland, and on 30 May 1323, was part of the council which agreed to a thirteen-year truce with the Scots. At the same time, the England's possessions in France were under threat from Charles IV of France, who demanded that Edward pay homage for the Duchy of Aquitaine. In April 1324, Edmund and Alexander de Bicknor, Archbishop of Dublin, were dispatched to France on a diplomatic mission. When diplomacy failed, he was appointed the king's lieutenant in France. Reinforcements from England failed to arrive and in the brief war which followed, the English lands were quickly overrun by the French, and Edmund was besieged at La Réole. He held out until 22 September, after which he was forced to surrender and agree to a six-month truce with the French. In late 1325, Edmund married Margaret Wake, daughter of John Wake, 1st Baron Wake of Liddell and Joan de Fiennes, and the first cousin of Roger Mortimer, the couple had four children. Their first child, a son, Edmund, was born in 1326 and was followed by a daughter Margaret, who later married Arnaud Amanieu, Lord of Albret. The couple's third child, another daughter Joan, known as 'the Fair Maid of Kent' and destined to marry Edward, the Black Prince and become mother to King Richard II, was born on 28 September 1328. Joan was followed by Edmund's posthumos son, John, in 1730. King Edward II's refusal to pay homage to his French counterpart was based on concern for his royal sovereignty, but also on fear of a potential resurgence of revolt at home if he left England. He therefore sent his wife Isabella of France, the sister of the French king, to negotiate with Charles. In September the queen was joined by her eldest son, Prince Edward, whom it was agreed, would perform the required homage in his father's place, which took place on 24 September. Soon after, Edmund joined the queen and her son in Paris. Opposition to Edward began to centre around his neglected queen, which included the exiled Roger Mortimer, earl of March, who became the Queen's lover. Edmund defected to the rebels, although he still distrusted Mortimer, his mounting hatred for the Despensers seems to have been the deciding factor. Both the queen and Edmund ignored Edward's order to return to England, which resulted in his lands being confiscated in March 1326. In August, Isabella and Mortimer, accompanied by Edmund, launched an invasion of England. Underlining the king's unpopularity, they gained the support of a large section of the English nobility, including Edmund's brother Thomas, and Henry, Earl of Lancaster, the executed Thomas of Lancaster's brother. Edmund participated in the trials of the two Despensers, and in the council transferring power to his nephew Prince Edward, who was crowned as King Edward III. As the new king was only fourteen years old, Isabella and Mortimer governed the country as unofficial regents. As the Northern situation was still strained, Edmund was given joint command of the Scottish border along with the earl of Lancaster, however, the two quarreled and Lancaster was granted sole command. Due to the prominent position acquired at court by Mortimer, Edmund grew disenchanted with the new regime and in the autumn of 1328, Edmund and his brother Thomas joined Henry of Lancaster in a conspiracy against Isabella and Mortimer, however, on it becoming evident that the conspiracy would fail, the two brothers abandoned the enterprise but Edmund's popularity at court waned as a result. Although he attended the coronation of his nephew's wife, Queen Phillipa in January 1330, Edmund's appearances at court became less frequent. Hearing rumours that his brother king Edward was still alive, he became involved in a further plot against Mortimer, which was discovered and in March 1330 Edmund was condemned to death. Upon learning that the death sentence had been passed, Edmund pleaded to his nephew Edward III for his life, offering to walk from Winchester to London with a rope around his neck as a sign of contrition. A writ was issued to arrest his wife Margaret Wake and imprison her at Salisbury Castle, along with the couple's three children, was issued five days prior to Edmund's execution. 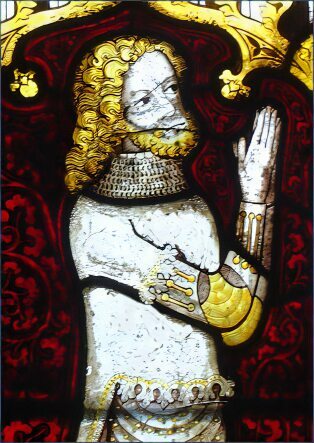 Edmund was beheaded on 19 March 1330 , he was aged just twenty eight at the time of his his death. His body was at first buried in a Franciscan church in Winchester, but was later removed to Westminster Abbey in 1331. His widow gave birth to a son, John, shortly after, on 7 April, during her imprisonment. His execution contributed to the decision of the seventeen-year-old king Edward III, who had not been informed of the decision, to rise up against Mortimer. In 1330, Edward carried out a coup which placed him in personal control of government, and Mortimer in turn was executed. Among the charges against Mortimer was that of procuring Edmund's death, and the charges against the late earl of Kent were annulled. Edmund's lands and titles passed to his oldest son Edmund, who died in October 1331. The earldom of Kent was then inherited by his younger son John.